After polling several of the experts, there are three different ways people choose to set up for Golden Tee Live 2008 Eagle Crest. The most popular choice is to play with the low-loft (FTX) clubs and the orange balls. Another option that several people prefer is to play with the old hybrids (“old birds”) and the orange balls. Finally, a smaller group of people prefer to play with the low-loft (FTX) clubs and the D2 (high-spin) balls. Of course, the choice is yours, but it’s helpful to know how the pros set up to play Eagle Crest! Let’s get started! 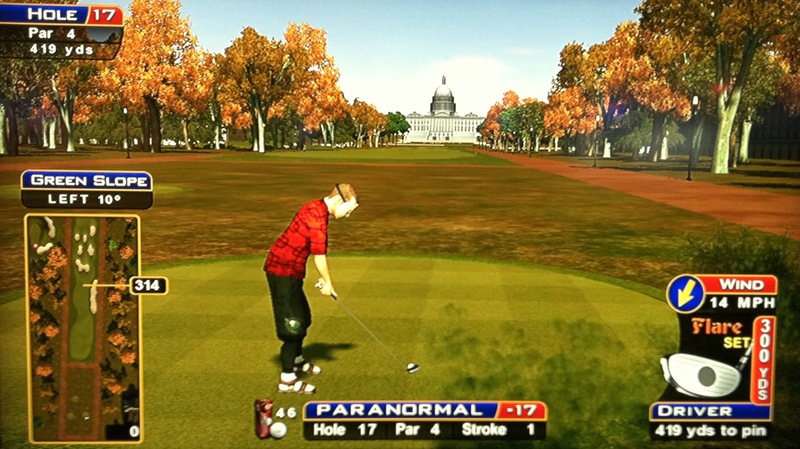 This one is straight-forward.Drive it straight, bring your approach in, and putt for birdie. Here’s an example hole-out. Play from a B.5 – 2.5 to C3 drive depending on the wind. Curve it around that corner and keep it in the fairway. From the front box, use backspin so you don’t go too far and have a tree in your way. 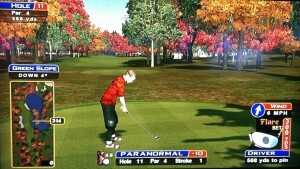 From the back box, use topspin so you stay on the fairway and avoid the little tree on the left. 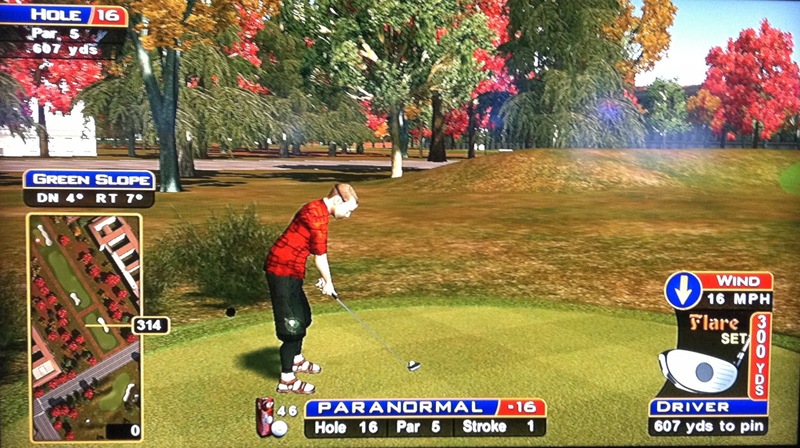 Bring your approach in and putt for birdie again! Huge green, so don’t be short! Use backspin with a front pin, or use no spin, land and roll up with a back pin. Here’s a hole-out from the middle box. Several options here, but option one is by far the consensus way to attack this hole for eagle. UPDATE – Learned more recently, this hole can be drivable! Check out the second hole played in this Freaky Friday video, where a high-teed A1 310 driver went under the first set of trees and over the next. One – Hit a C3 6-iron with topspin off the tee. Up ahead, just in the rough to the left, are two shorter trees. 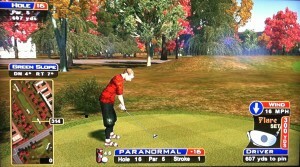 The one on the right is further away and your ball will clear it. The next one left of that is closer and your ball will hit it. So just make sure your C3 goes around the 2nd tree. You will end up with a straight in shot with a 5wd-driver. This one got through it all and had an open approach shot. Most of the time you will rotate left one spot to play this C3 shot, and rarely you can rotate two spots left for this shot. If you don’t have a 6-iron, you can use a 9-wood with more of a C2-type shot. Here’s an example off the tee that left an open approach. 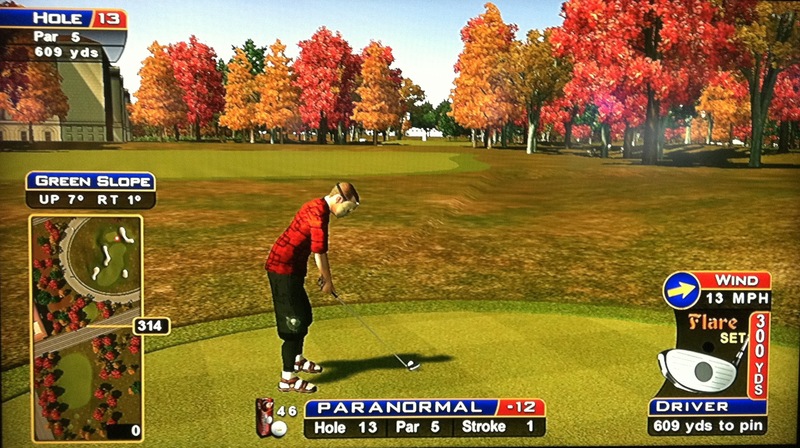 Two – If the wind is blowing straight ahead, land your drive in the lower-left quadrant of the fairway, just past the trees on the left. 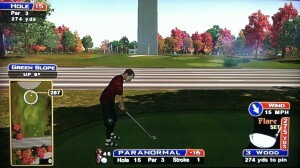 Then hit a A1 driver with backspin to curve around the monument onto the green (the wind will help)! 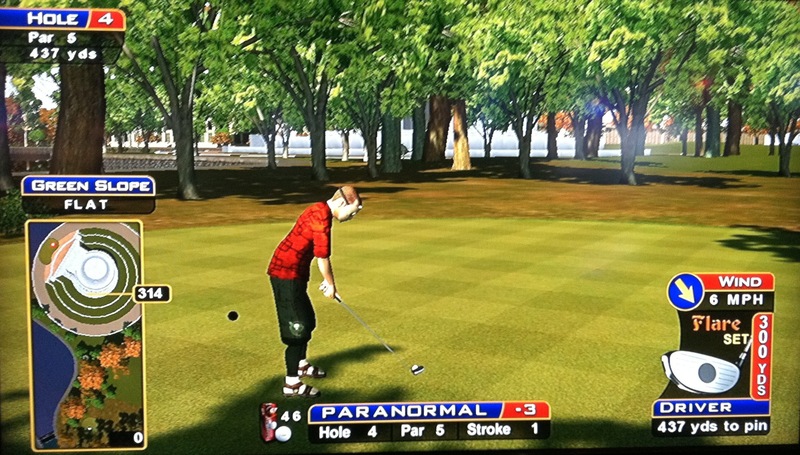 Don’t miss right – the worst place to end up is up against a wall where you have to punch out for your 3rd shot. Three – If the wind is blowing at you, blast a C2-type drive with roll to the upper-left quadrant of the fairway. 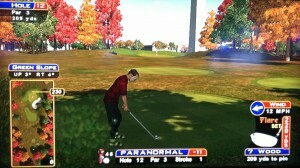 Then hit a C3 driver or 3-wood with backspin (the wind will help) onto the green to putt for eagle! Four – Blast a driver straight ahead, landing in the left half of the big square fairway. 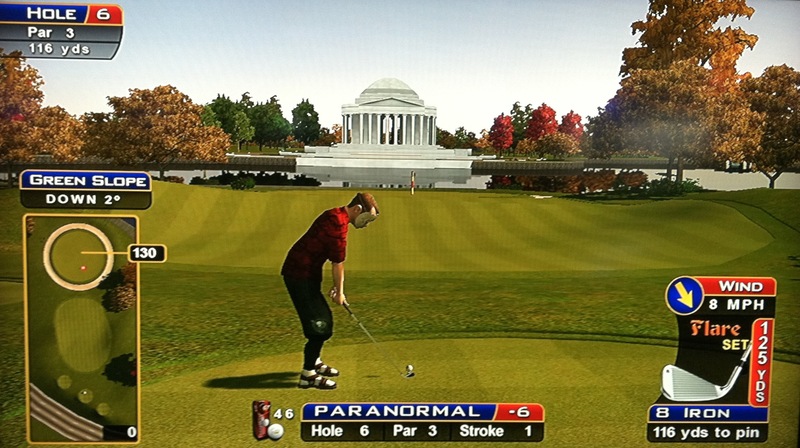 Bring your approach shot straight through a hole in the columns in the Jefferson Memorial with a backspin driver, and putt for eagle — here’s an example hole-out with a nice deflection! Five – Rotate way left and hit an A1 low-loft driver through the trees and over the lake to set up your approach shot. Six – Hit a C3 1-iron with roll through the trees that should end up by a spaceship! From there, you can hit a 3-wood or 4-wood into the green for an eagle try. From the front tees, you can play a huge C3 driver with topspin to roll onto the green. From the middle box, you can sometimes play the same shot and bounce on. From the back, you can’t get there, so lay up and bring an approach in for a birdie putt. Another huge green. Use backspin with a front pin, and use topspin or no roll to get to a back pin. Not drivable, so don’t try it. From the front tees, the safe play is to hit a C3 5-iron with backspin to cut the corner a bit. Rather, you can rotate left 3 times, hit a driver with topspin through a gap in the trees, and end up in the fairway or rough just past with only a 8-iron to PW approach shot! From the middle box, stay straight and hit a B3 2-iron backspin to cut the corner a tad, keeping it on the fairway. From the back box, you can rotate left twice and hit a 5-wood backspin C3 over the gap in the top of the trees. It leaves about the same 8-iron to PW approach shot as the front box shot does. If you don’t have a 5-wood, play a small hook straight ahead similar to the middle box shot. 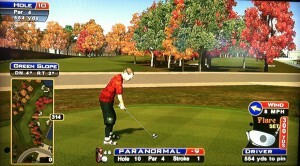 Make sure you hit your tee shot far enough out so that the tree on the left doesn’t interfere with your approach shot! Here’s an example hole-out. Drivable from all 3 tee boxes. You will bounce up onto the green (sometimes through the sand) and stick it for an eagle putt! From the front box, hit a B.5 – 2.5 to C3 3-wood with backspin, depending on the wind. Here’s a great ace from there. Here’s a nice 3-wood over the top corner of the trees. From the back-right box, hit the same angled shot with a backspin driver. From the back-left box, use a backspin driver with a full C3. From the front tees, hit a soft C3 driver or full 3-wood with backspin to end up on the green or just off it. Sometimes your ball will skip across the water here on its way to the green! Pay close attention to where the pin is here because if it’s all the way left and you barely get on the right side of the green, you’ll have a 200′ putt and will be 2-putting at best. From the middle box, you can sometimes get there with the right wind or big enough hook, but if it doesn’t look like your C3 will get around the trees or clear the water, don’t try or you’re looking at par. From the back box, just lay up in the fairway. Blast an A1 drive with topspin down the fairway – the amount of hook you play depends on the wind. Make sure you stay left and get far enough so the trees on the right don’t get in your way! Watch out for the sideways “V” shaped sidewalk. 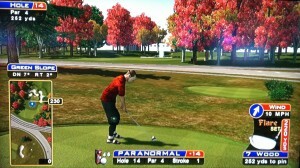 That’s an unplayable lie. 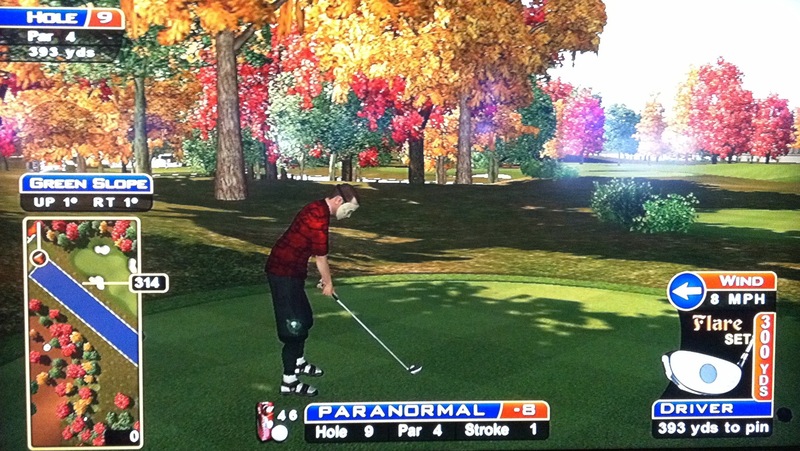 Alternatively, you can play a straight B2-type drive with roll out to the left side of the fairway if you can hit it far enough to avoid having your approach shot blocked by trees on the right. Here’s a straight-in approach. This approach shot is tough, especially with a low-lofted club. 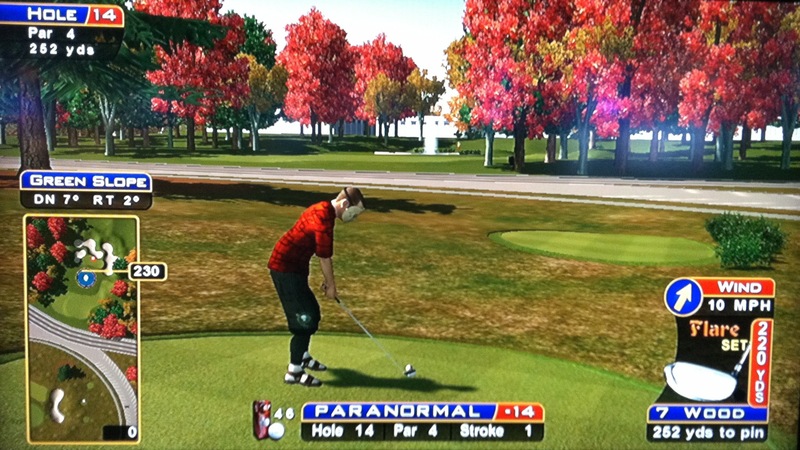 Sometimes it’s tough to attack the pin, so make sure you hit the green first! Hit far down the fairway, try to at least get parallel to the end of the sand on the left. Usually a 2-iron to 3-wood 2nd shot. Here’s an example hole-out. Don’t be short! 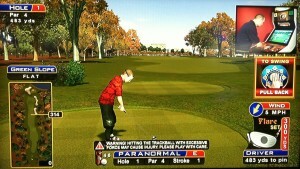 If the pin is in front, aim for the end of the green and backspin the ball down the hill. Here’s an example hole-out. You have to get across the road to be able to make this in 2. Most of the time you can just plow a straight driver. Sometimes you may have to click left once and hit a big A1 to get there. If you’re in the fairway, or first cut, you’ll have a 5-wood to driver approach shot. If you’re in the rough, good luck getting there in 2. It will take a great wind + a good hammer shot straight. In any case, you should try to carry the road, because you can’t get there in 2 anyway unless you do! 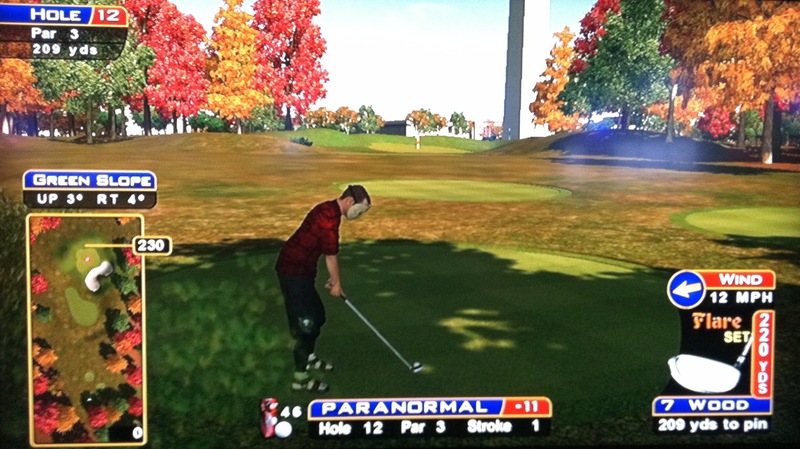 Also, the ball doesn’t bounce/roll off the road like you’d expect in real life – it likes to just stick there. Here’s an example hole-out. Always drivable with anywhere from a 3-iron to a 3-wood. From the middle and back tee boxes, a 4-wood and a 5-wood will both clear the trees that overhang the right side. Here’s a nice 5-wood from the middle box. From the front boxes, you’ll need to hit a B1 shot around the trees. 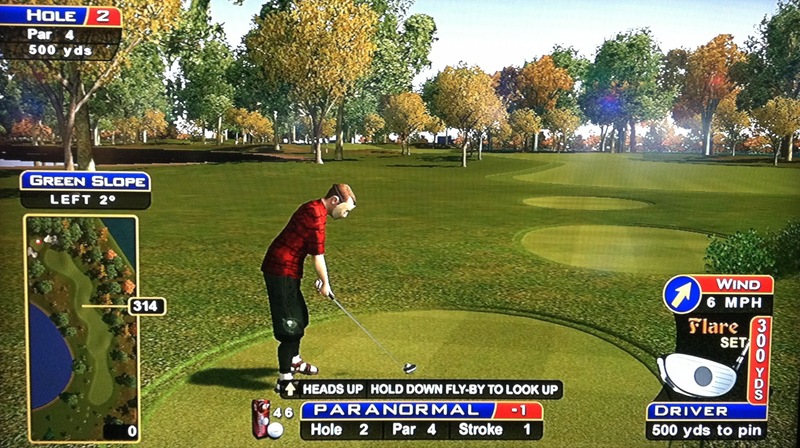 If you are close enough to hit an iron, in order to stop on the green, you will need a big headwind, or if that’s not the case, hit to where your first bounce is on the hill and then bounces up onto the downward sloping green (this takes a lot of practice and you need to be aware of how soon the 2- and 3-irons land to be able to perform this shot. A 5-wood or 3-wood can usually land the green with backspin and stay on. Here’s a great 3-wood hole-out from the back box! If you do club up, remember not to hit it too hard – I’m almost always long on this hole. But, watch out for the flower bed short of the green — if your ball stops in there, it’s an unplayable lie. Most people have trouble with this hole, so if you go long and into the sand, you’re still looking at birdie. 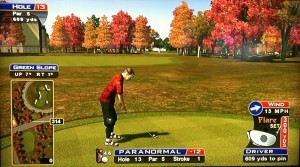 If you’re short and wet, par is your maiden. Be extra careful with a low-lofted club — it will often come up short in the water if you don’t aim for the back of the green! That is, unless you can manage a SKIP, like this incredible shot! Huge green, but there’s a big upward slope, so make sure to stick this one close to the hole! 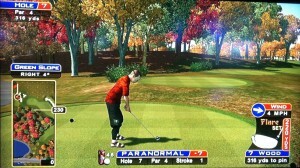 Ideally you want to leave a short, uphill putt, but if that happens, you weren’t aggressive enough! 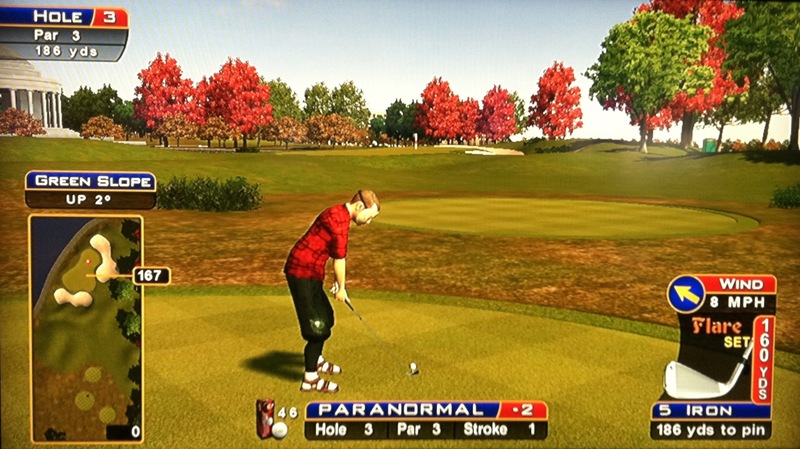 Downhill putts can lip out, and side-sloping putts are obviously much tougher here. With a front pin, hit long and use backspin, and consider using roll with a back pin to help get it close. Here’s a hole-out from the short middle box. Here’s another hole-out from the back box. This is a long hole that’s always difficult to reach in 2. 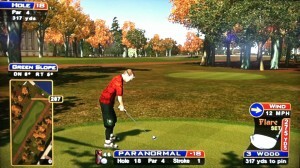 The key is keeping your drive in the fairway to give you a chance! Lots of tee shots end up in the right rough, so keep it left and on the fairway! From the front left tee box, you can get to the second fairway if the wind is to the left with a big C3. If you don’t clear the brown road, you’re more than likely not making the green, so if you’re not 100% sure, just get to the end of the first fairway. From there, it’s a 5-wood to driver approach. 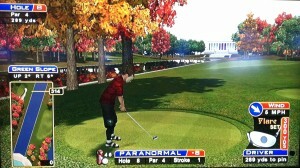 From the middle right box, hit an easy B3 around the tree and to the end of the first fairway. From the back left box, a driver might not be the shot here because with a wind to the right, it won’t hook back enough. Hitting a 3-wood C3 will clear the tree that’s sticking out and you’ll be able to stay on the fairway. You can’t get your approach there from the bunker, but you can still sometimes get there from the rough. Check out this hole-out from just off the fairway. 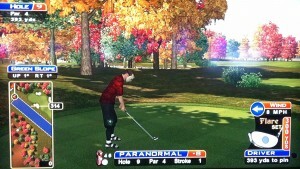 This is a really tough par 4 with several options. Very rarely will this hole set up to drive the green with a huge C3 and a great wind. 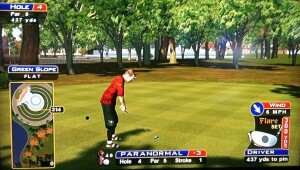 Maybe 5% set up that way, plus you’ll need an extremely lucky turbo bounce up and out of the sand guarding the green. You’re better off not even trying it because if you get in the sand directly right of the green, you need a lob wedge to get out of it. One – Rotate left one and hit an A1 with roll. This will usually get you far enough out in the fairway so you don’t have to worry about the trees on the left for your second shot. But watch out, because sometimes you could be in the sand with a hill too big to clear. Hitting your tee shot to the rough or dirt road to the right of those traps will leave an iron or 5-wood from the dirt. Backspin doesn’t work as good from either, so watch out. Here’s a hole-out playing a bit of cut. 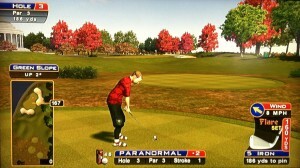 Two – You can lay up short and hit a 5-wood over the gap in the trees to the green. Three — Sometimes there’s no way you can get past the trees for a clear second shot. 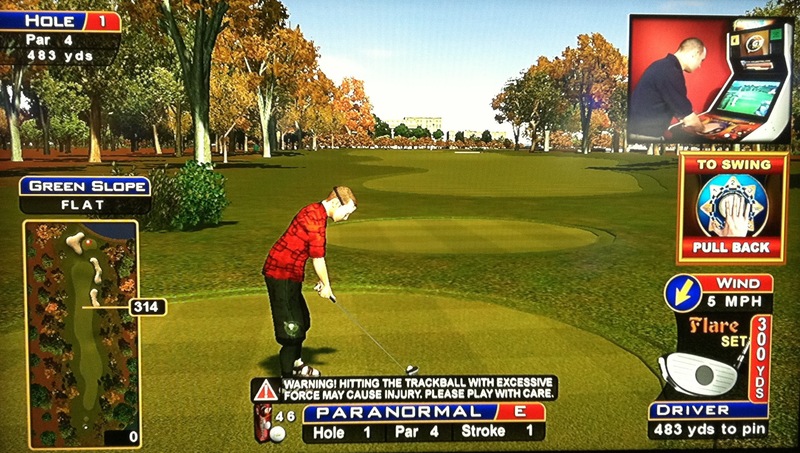 And keeping your tee shot in the fairway isn’t easy. There is a shortcut through the trees on the left. 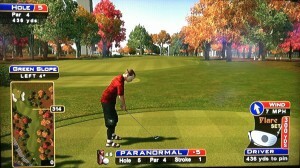 You can rotate once left and hammer a 3-wood over the first line of trees (or play a C2 5-wood over them too). In the right conditions, you’ll land in a clearing with a clear straight shot to the green. This one is always drivable. You will need an A1-C3 3-iron-Driver with backspin depending on the tee box and wind. From the close middle set, a nice thumb driver backspin will do the trick. From the back middle box, hit a hard driver — here’s a nice hole-out. From the left boxes, depending on wind and trees in front of you, you should usually hit a B3 shot with backspin using a 5-wood to driver. Here’s a great ace from there! From the right boxes, hit a B1 shot around the trees. Occasionally from the front left/right boxes you will need to turn left or right and hit an A1 or C3 with a 3-iron or 2-iron. Watch out when hitting this type of shot, because it goes a lot farther than you’re expecting.